Torrefaction for large scale biomass production is a promising technology that has emerged in the last few years as a way to enhance bioenergy supply chains. This article presents a technology analysis of the torrefaction process. To do this I first define torrefaction and then explore the process. I then look at the current state of the art (SOTA) in torrefaction technology and discover there are a range of technologies under development. The economic, social and ecological costs and benefits of the technology are then discussed and it becomes evident that given that torrefaction’s goal is generally seen as the commoditisation and internationalisation of bioenergy, this technology is inextricably linked to the contentious and complex debate around increased use of biomass to energy technologies. It is important to understand both the unintended, indirect and delayed issues that may arise and then to understand the information gaps and uncertainties that add to the risk of the technology. To give perspective to this, I compare this technology to large scale wind and the various political influences that may be at play with regards to the engineering process. This analysis produces the interesting result that caution is needed before encouraging wide-spread adoption of such technologies. In the specific case of torrefaction, understanding of social issues in particular is needed, as well as research and selection of specific feedstock, technology and supply chain configurations that maximise sustainability outcomes. 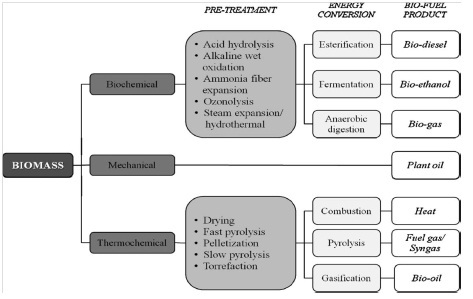 Torrefaction involves “soft thermal treatment” (Thermya 2009) of biomass to create a treated feedstock for use in gasification, pyrolysis, or combustion technologies. Technically it is “mild-pyrolysis and is a thermo-chemical pre-treatment of biomass at 200° to 300°C” (Shah 2011). As outlined by Uslu et al (2006) the term TOP process, which is a combination of torrefaction and palletisation, (a densification process) is often used interchangeably with torrefaction, as it is currently perceived to be the most efficient form of the process. In addition, it is generally assumed in literature that when talking about torrefaction one is referring specifically to feedstock consisting of lignocelluloses biomass, (i.e. plant based) as opposed to animal based. The key stakeholders that interact with this process are: the technology developers; upstream and downstream members of the bioenergy supply chain; competing energy technology types (solar, wind etc); regulators; those competing for ecosystem services; and the general public from both developing and developed communities. When the output of torrefaction is used for co-firing with coal, stakeholders include owners of power-stations and related lobby groups. 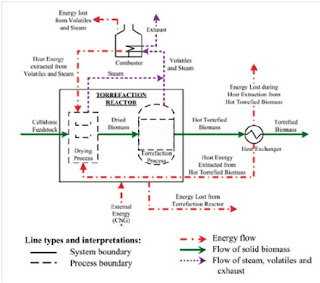 Torrefaction is one of a series of chemical and mechanical engineering options that try to optimise bioenergy supply chains. Chew and Doshi (2011) created a diagram that captures the core conversion steps in this supply chain (Diagram 1). The overall goal is to create systems that have the smallest (or negative) carbon footprint, at the most competitive economic price, with lowest social impact. There are many properties that enable torrefaction to improve the bioenergy process and market. These include better management of moisture, ability to combine feedstock, improved storage. These attributes all increase the volumes of biomass production, facilitate easier international trade in biomass, and provide supply chain reliability and flexibility (Shah, Deng, and Chew 2011). These factors in turn lead to the commoditisation of biomass and allow for development of a more transparent and functional global market. Torrefaction improves the grindability (Deng 2009) of biomass which allows for the product to be used for co-firing in coal fired power stations, lowering the capital investment required to improve the carbon footprint of plants. Finally, perhaps the most important characteristic is the improvements in energy density. Gamorg et al (2009) provided a well supported claim that biomass is a relatively energy inefficient fuel source given its low Energy Return on Investment (EROI) and low power density. Torrefaction seeks to address this by increasing the energy density of the fuel early in the supply chain. 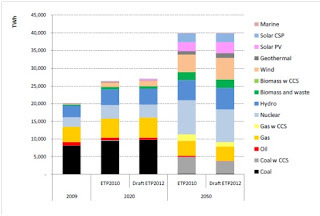 TOP energy content is as high as 20.4 – 22.7 GJ/ton (Uslu 2006). The torrefaction process is part of a system defined in Rammelt (2012 p26) lecture notes as “two stock systems, one renewable” . The key drivers of such a system are the growth goals, capital lifetime, the stock of biomass, the inputs into regenerating biomass (sun, water etc). The system is also affected by non-linear relationships of price, regeneration rate and yield per capita unit. The nature of this system means that biomass can potentially provide base load power right now. Torrefaction allows for more reliable flows due to greater storage properties both from energy density and moisture perspective. The following diagram shows an engineering process outline of a torrefaction reactor. As mentioned torrefaction is a thermo-chemical process that occurs in the absence of oxygen. During the process the molecular structure of the feedstock is modified. This represents a decomposition of “hemi-cellulose” material to form torrefied biomass (Thermya 2009). This liberates water and evaporates volatile organic compounds (VOC’s) such as acetic acid, methanol, furfural and water, and permanent gases such as CO2, Carbon Monoxide, methane and hydrogen (Shah 2011). The energy balance for this process is based on initial energy in biomass, energy used in the process, total energy lost, energy reclaimed, and energy content in the final product. Chew et al (2011) estimated the energy yield for woody biomass at 250°C was 95%. There is, however a major spread of results, (dependant on temperature and feedstock) of between 28% and 98%. 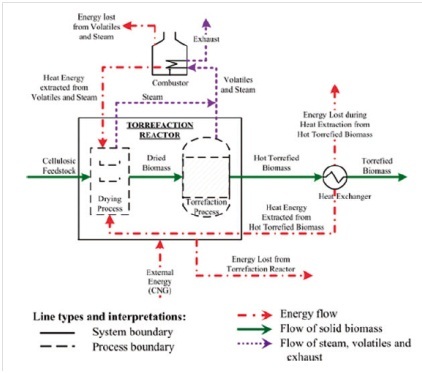 Uslu et al (2008) demonstrates a typical energy balance for the torrefaction process in Figure 3. Although there are many progressed torrefaction plants, the technology is not currently considered commercialised in much of the literature (Chew 2011, Uslu 2006, Shah 2011,Englisch 2010). The first plant was Pechinery in 1987, however it became quickly evident that scalability was the major challenge with this plant. There are now many competing torrefaction concepts, many of which revolve around the type of reactor used. There are six main types of reactors. Kema (2011) defined the key existing options as fluidised bed, moving bed, torbed, micro-wave, belt conveyor, screw conveyor. All have similar characteristics (see figure 3). All of these alternatives are grappling with challenges of optimisation of process efficiency, economic viability, energy efficiency, maximising operating efficiencies (including managing waste residues), and scalability. Process issues vary depending on the particular goal of the system. Some aim to manage high moisture content, others maximising the removal of sulphur and chlorine, while others focus on maximisation of energy output. If the co-firing with coal is the objective then producing an output close to the properties of coal is the objective. The key message is that in future many specific plants will be built using different technologies for different purposes. Torrefaction should improve economic feasibility of biomass leading to further investment into the industry and creation of jobs, both directly, (in the technology itself) and indirectly, (through related industries such as forestry farming). There are many claims that it will create a market for useless by-products of farming and thereby create new revenue streams for the developing and developed world alike. This has been challenged by Gomiero (2009) who suggested that there may not really be any such bi-products, (as they provide e competing eco-system services) and expansion to bioenergy may encourage multi-nationals to enter markets, pushing smaller farmers out of the market. Another contentious point has been whether the energy return on investment (EROI) is , in fact too low. Macgill (2012 p 13) showed that Biofuels are around .1:1 return, with others (Gamborg et al 2011) arguing that it may in fact be a negative return if you take NO2 used in fertilizers into account. Using the torrefaction and palletisation process, and focusing on wastes and residues Shie et al (2011) claim that the EROI can be brought to around 7:1. 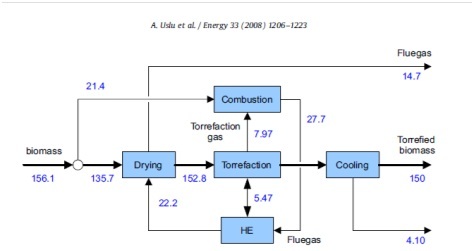 Prins et al (2005) concluded that “if heat produced in the gasifier is used to drive the wood torrefaction reactions..chemical exergy preserved in the product gas is shown to increase”. As such it would appear that the process at least improves existing bioenergy plants. Shie et al (2011) provided a model for net energy analysis (NEA) that includes the full lifecycle of all components relating to development, operations and dis-assembly of a torrefaction plant. On an operational basis the key raw materials consumed in the process consist of the feedstock. Other components considered were energy in transport fuels, generator fuels, buildings and production facilities, and storage tanks. Models even consider workers and their households. Transportation and pre-treatment represent the most significant energy users. Shie et all considered four facilities and the Net Energy Balance for the four assessed systems was on average 1.79 x103 MJ/ tonne-year. From a full lifecycle perspective, it was seen as positive. In addition the wastes include the buildings and facilities, and there are no major hazardous wastes. The wastes include negligible amounts of sulphur and nitrogen and the major issues are around tars and dust that accumulate (there is little published research into these waste products). The picture below is an example of such wastes (Englisch 2010). Torrefaction can also create a product that can be used for co-firing with coal-fired power-stations without a significant retrofit of such power stations lowering the required capital expense for meeting carbon reduction targets. This could have significant economic benefit in terms of reducing the short term capital expenditure required to meet carbon reduction goals. On the other hand, from an ecological standpoint it may prolong and encourage investment into coal based solutions and away from more sustainable solutions. If torrefaction was to be successful, perhaps its most significant impact would be the rapid increase in scale, internationalisation, and commoditisation of bioenergy. From a social perspective the debate about bioenergy is focused on competition with food crops and food security. A potential collision between population explosion and biomass growth is seen as a significant concern. As Gamorg et al (2011) outlined it should be noted that there are so called “first generation” (palm oil, soy, sugar cane or corn) and “second generation” biofuels (derived from lignocelluloses biomass derived from non food or food co-products) . The issue with first generation biofuels are clear – they essentially put use of energy in direct competition with feeding the world – an increasingly difficult task. This may lead to delayed impacts as feedback loops are created between commoditisation, price increases, and increased production. Second generation feedstock is promoted as solving many of these issues – potentially even creating new revenue sources for developing nations. The question even with these second generation feedstock is whether you are still displacing parts of existing systems. In addition as outlined by Gamborg (2011) this also brings into the limits to human appropriation which can threaten biodiversity and soil preservation. Other potential social issues revolve around food security and food price rises and the impact on developing nations. There are many information gaps and uncertainties that remain with torrefaction. The entire process itself requires further validation. There are questions around the most efficient process (trade-offs between energy yeild, product quality, product costs). For example independent specialist KEMA anticipated that there would be a trade-off between lower energy yield and higher throughput. As outlined in MacGill (2008) it appears that many of the current proponents are naive in terms of the realistic speed of deployment and “orgware” required to ensure acceptance of the technology. Some of the direct constraints to growth of torrefaction include the immaturity of the technology, political nature of biomass, unresolved issues around co-firing process, limited knowledge around production systems issues such as handling, fire and dust (BC Bioenergy Network 2011) There are also significant questions about who will finance and commercialise the technology (Sklar 2011) . As mentioned above, there is also insufficient research into the direct waste products from the process. There is also significant gaps around the CO2 pricing baseline that will be adpopted internationally. A potential projection for this technology can be extrapolated from the bluemap scenarios from the IEA (2010). As per diagram 5 there will be significant growth in use of bioenergy. If this is correct then a technology such as torrefaction that has beneficial properties would seem to be in a good position to capitalise. The same figure demonstrates all the competing clean technologies and perhaps the biggest challenge for technology developers in this industry is that the enormous amount of investment into new technologies may lead to significant breakthroughs that make entire technologies redundant. In addition these “clean technologies” are subject to legislative change including incentives that will directly impact return in investment. I believe that it is instructive to compare torrefaction against a competing renewable technology – in this case wind. Wind has significant advantages: it has an EROI of 20:1, there is no alternate use for wind and there are no emissions from wind. On the other hand Biomass is cheaper than most large scale wind plants (see Figure 4 above), wind has complex permitting issues and wind does not support baseload power. Given the large existing investements in coal fired infrastructure, co-firing of torrefied biomass may present a bridging technology to meet renewable targets as technologies such as wind come on stream. This would present biomass as the lesser of two evils as against coal fired energy production alone. There are many social, conomic, cultural and political influences on the engineering process with regards to torrefaction. There are vested interests who have invested millions in the development of the technology. There companies and individuals that that stand to significantly increase their earnings if the commoditisation of biomass becomes a reality. There are countries that are better positioned, given their natural endowerments, to take advantage of global trade in biomass (Faaij 2011 p2). If you consider the co-firing opportunity then you also bring the large and powerful coal lobby to the table. There is signficant risk of increased encroachment on areas of cultural significance particularly if old growth forests are harvested ( Framstad et al 2009). There are also NGO’s and other formal and informal governance structures in place that seek to protect the social and cultural interests of those that potentially stand to suffer from the growth of biomass. All these groups bring potential to influence engineering from either a material basis (ie funding contributions), or in terms of political allignment of engineers. Torrefaction is a process is gaining traction and visibility in the clean technology market. It appears decievingly simple, however it is the nuanced nature of the process, and its position within significant biomass supply chains that lead to complexity. The technology brings promise in terms of economic, ecological and social benefit, however on close inspection there are particular issues that need resolution in each of these areas. Before the technology can be seriously considered it needs to be further commercialised, and the barriers to growth in the industry confronted. I do not believe these barriers are insermountable, and it appears that systems are being promoted as ready for market now. From an ecological policy makers must determine measurement and verification standards for biomass and a structure must be put in place to create transparency in land change, and land use before scaling technologies such as torrefaction are adopted. Policy makers must also give consideration to the protection of the vunerable in our society , in developing nations in particular, from the adverse consequences of bioenergy competing with food stocks, and from the mass appropriation of our biological resources into a highly commoditised form feeding a hungry global energy market. Est van, R. & Brom, F 2010, Technology assessment as an analytic and democratic practice Encyclopedia of applied ethics (2nd ed.). Amsterdam: Elsevier Science Publishers.